Tiny generators that could produce enough electricity from random, ambient vibrations to power a wristwatch, pacemaker or wireless sensor would offset a bit of lithium and stacked might replace some of those transformer blocks to recharge batteries. 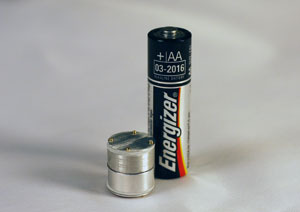 Miniature Piezoelectric Generator. Click image for more info. Khalil Najafi, chair of electrical and computer engineering and Tzeno Galchev, a doctoral student at the University of Michigan Engineering Research Center for Wireless Integrated Microsystems have created an energy-harvesting device that is highly efficient at providing renewable electrical power from arbitrary, non-periodic vibrations. This type of vibration for example could be a byproduct of traffic driving on bridges, machinery operating in factories, the refrigerator compressor, water pipes, and people just moving their arms and legs. The research and engineering pair are calling the new device Parametric Frequency Increased Generators (PFIGs). In the course of exploring the field the research team built three prototypes and a fourth is forthcoming. In two of the generators, the energy conversion is performed through electromagnetic induction, in which a coil is subjected to a varying magnetic field using the principle similar to how large-scale generators function in big power plants. The latest and smallest device, which measures one cubic centimeter, uses a piezoelectric material, which is a type of material that produces charge when stressed. The third version has applications such as infrastructure health monitoring. The tiny generators could one day power bridge sensors that would warn inspectors of cracks or corrosion before human eyes could discern problems or power wireless sensors deployed in buildings to make them more energy efficient, or throughout large public spaces to monitor for toxins or pollutants. The list could get very long. The numbers that might matter most is the team has the latest generators demonstrating they can produce up to 0.5 milliwatts (or 500 microwatts) from typical vibration amplitudes found on the human body. That’s more than enough energy to run a wristwatch, which needs between one and 10 microwatts, or a pacemaker, which needs between 10 and 50. A milliwatt is 1,000 microwatts. These numbers are a bit of surprising good news. Galchev said, “The ultimate goal is to enable various applications like remote wireless sensors and surgically implanted medical devices. These are long lifetime applications where it is very costly to replace depleted batteries or, worse, to have to wire the sensors to a power source.” Galchev is on the best point – battery oversight and replacement are time consuming and often costly processes when endlessly repeated or running line or transformer power is capital intensive even if the energy use is minimal. Najafi makes an astute observation, “There is a fundamental question that needs to be answered about how to power wireless electronic devices, which are becoming ubiquitous and at the same time very efficient. There is plenty of energy surrounding these systems in the form of vibrations, heat, solar, and wind.” The question will be cost. The university is pursuing patent protection for the intellectual property. Galchev and a team of engineering and business students are at work to commercialize the technology through their new company, Enertia. Enertia recently won first place in the DTE/U-M Clean Energy Prize business plan competition and second place in the U-M Zell Lurie Institute for Entrepreneurial Studies’ Michigan Business Challenge. Other members of the team are Erkan Aktakka, and Adam Carver. Aktakka is an electrical engineering doctoral student. Carver is an MBA student at the Ross School of Business. Good luck kids. Get to know your customers and what they need. Recheck that photo. At about a third the height and a little more diameter than the AA battery, three of these stacked up would get you 1.5 milliwatts, six 3 milliwatts. That’s getting somewhere. With a rechargeable coin size battery for the non-shaking periods the product should have a future. Now if one could just keep on shakin’. . . Couldn’t resist. I’m sorry for the off-topic question but could you show me wher I can find the website design that you are using on your homepage? I’d love to get the same blog template or perhaps a similar one. Could you tell me where it is from? Good article, great resource, I enjoy reading this a lot. How can I get notified for more articles posted? It’s the best comparison with the useful imformation, thank for sharing.